What’s happened to rents in London and the UK after the Brexit referendum? Evidence from a new rental index. Everyone talks about house prices – either rising or falling – as a vital indicator of local and national economic health, and a range of indices frequently make the headlines. Rents get less robust attention, largely due to a scarcity of good timely information on the current state of the market. This is clearly a problem, since now nearly 20% of households are private renters in England, and nearly 30% in London, a figure that has nearly doubled from what it was 10 years go (Survey of English Housing). It’s also a gap in our information about the economy, because rents are likely to be more responsive than sale prices to current conditions, local and national, and so a better barometer of pressures in the market. Turnover in the sales market is much slower, since people keep owner occupied homes for longer and properties can spend a long time on the market. In general prices reflect people’s expectations about long-run trends and will be sluggish to adjust to unanticipated shocks. Last year I spent a bit of my time developing new rental indices for HomeLet based on their private rent data to try to address this omission. The index aims to carefully adjust rents for changes in the types of properties being rented out and their location, just like the leading house price indices. Fortune telling based on price indices can be a futile exercise, but these new rental indices are starting to reveal some fresh information and interesting patterns. Figure 1 plots a range of different trends spanning June 2014 (the start date for reliable rent data) to July 2017. The trend in blue is the publicly available monthly Nationwide House Price Index for the UK. The red line is a version of the new HomeLet index of private sector rents, based on new rental agreements for the UK. At the bottom, in green, is the ONS ‘experimental’ rents index. There are some intriguing features here. Unsurprisingly, all the indices agree rents and prices have risen in general over this period. Broadly speaking rents for new agreements and house prices follow similar patterns, and, up until June 2016 followed each other reasonable closely. These new rents exhibit a marked cyclicality, rising over the spring up to July and then tailing off a bit in the summer and autumn. The fall-off in rents in June 2016 looks dramatically deeper at the end of 2016 and beginning of 2017 – more on which later. The broad similarity of the patterns in rents and prices is quite reassuring for people who like their economics simple, because the fundamentals of housing should be similar for both renters and owners. To an approximation we would expect prices to roughly reflect the value of the rents the property could generate in the future (plus expected capital gains, less depreciation, maintenance etc). Even so, it is often said that prices are rising much faster than rents in the UK, perhaps something to do with constraints on development making land scarce and pushing up property prices in anticipation of future capital gains, or some other form of speculative bubble or incentives that favoured buying, such as “Help to Buy”. As it turns out from this - admittedly short - time series of data, that wasn’t actually true nationally between mid-2014 and mid-2016 if we compare new rents with prices. One reason underlying the perception that prices rise faster than rents might be that the main point of reference has been the ONS rental index – the green line – which indeed suggests rents have climbed in a sluggish plod, showing a 7% rise since June 2014. Prices, on the other hand, increased by over 12%. These comparisons – if they represent the long run picture, rather than a short term blip - would mean that renting a home is an ever-increasingly cheaper option than buying, or else the expected percentage capital gain on housing sales is ever-increasing. Neither of these possibilities seems very plausible. But this comparison is misleading. The ONS index is based on valuation data and reflects average rents in the stock of private rental accommodation. This ONS index is based on data on rents for occupants of all lengths of tenure – those that have just begun a rental agreement, and those that have lived in a property for many years. This gives a poor indication of what a landlord can ask and what a tenant can expect to pay when setting up a new rental agreement. If new rents are rising. but landlords are less willing to raise rents for existing long tenure tenants than new tenants, then the rent in the stock will rise more slowly. Although this behaviour can be hard to rationalise, it is a commonly observed feature of the rental market. I we look at new tenancy agreements, as in the HomeLet data, things look more in line with what simple theory would suggest. But something dramatic seems to have happened in mid-2016. New rents fell sharply and stagnated right up until May 2017, while prices continued to rise, with just a brief dip early in 2017. What could have caused this drop in rents? While it is impossible to attribute causality with a simple time series like this, some more insights emerge if we split out London from the rest – see Figure 2. The blue line is the Nationwide quarterly house price index for London (unfortunately they do not publish a rest-of-UK index). The solid red line is the HomeLet rental index for London. The dashed red line is the HomeLet rental index for the rest of the UK. The green lines show the corresponding trends in the ONS rental index. Here it is clear that the trends in prices and rents in London departed company some time back in 2015. But what is more striking is that London rents nose-dived in mid-2016 falling about 4 % in the May-May year-on-year comparison. Indeed it is this fall in London that explains the drop in the national index in Figure 1. The fall over the summer in the rest of the UK is not much different from what it was in 2015. Rents have recovered in the last few months, but only to about where they were this time last year. House prices haven’t fallen (much, yet) in London – at least according the Nationwide index. But they have flattened off a lot over the period when rents started to tumble. What can explain this sharp fall in rents in London and why haven’t prices done the same? There are many candidate explanations, which surely have something to do with a fall in demand relative to supply of rental accommodation. The Brexit vote might seem like an obvious candidate. But it is a dubious explanation on its own. Although there is some recent evidence that net migration decreased over this period (mainly due to EU-8 emigration), there are still many more workers, both EU and non-EU, entering the country than leaving (net migration between March 2016 and March 2017 was +246,000). Based on recent years of data, London accounts for about 40% of net international migration which means an additional 100,000 foreign workers arrived in London between March 2016 and March 2017. By the way, if you wonder how these international workers are accommodated, some relevant facts to consider are that net international migration into London in 2015-16 was 126,000, net migration from London to other UK regions was 93,000 and the number of new dwellings completed was 24,000. The longer run economic outlook and exchange rate changes might be relevant factors too, but would expect house prices to be more responsive than rents if people were anticipating a future economic downturn or were concerned about exchange rate risks to their investments. So perhaps it is less to do with demand for living in London, and more to do with supply of rental accommodation and incentives for ownership versus renting. An associate of mine who is an expert in property valuation and knows the London market intimately, believes this is at least part of the story. Non-resident owners in London are letting their properties rather than selling, given the low interest rates and the low cost of holding property, which is has been increasing the supply of rental accommodation and pushing down rents. Whatever the explanation turns out to be for these patterns, this new index promises some unique insights into the rental market that have previously been quite obscured by lack of timely data. Deeper analysis is obviously required to properly understand the causes. Declaration of interest: I was given some remuneration for developing the code to estimate the HomeLet index, but have no other interests in the company. Simply looking at average rents in sample in new rental agreements is potentially misleading if the composition of the sample – in terms of the location, size, type and quality or properties being let – is changing over time. For example, in recent years the share of homes that are privately rented relative to owner occupied has increased but these changes are not evenly spread geographically. So changes in average rents will reflect both changes in the rent you can expect for letting a property in a given location, and changes in the number of properties being let in different parts of the country or different parts of a city. The changing patterns of rental locations and changes in the type of property being let can lead to misleading long run trends and to short run volatility in average rents. The ONS rental price index addresses this problem by estimating rents for a fixed ‘basket’ of properties – in much the same way as a retail price index looks at a basket of consumer goods, or house price indices such as those produced by the Nationwide and Halifax adjust for changes in the types of houses being sold. These are called ‘hedonic’ house price indices. The disadvantage of the ONS index for many users is that it estimates rents in the stock, rather than the price of newly agreed rents. The new HomeLet rental index combines elements of the ‘hedonic’ approach, with some ‘smoothing’ of the series over time. The source data contains information on 20,000 new tenancy agreements each month, across the UK. The index is estimated by looking at estimated changes in rents from one month to the next for lets within the same small geographical area (e.g. postcode sector). The method applies statistical techniques (regression) to adjust for changes over time in the types of property being let (like the ONS and Nationwide indices), but in addition smooths out short run volatility by using information on trends in rents in recent months, rather than only a single month (it uses local cubic polynomial smoothing). The index therefore offers a big step forward by providing the first index of new rental prices that is properly adjusted for changes over time in the characteristics of rental properties. Stephen Mosley, 2013, The Chimney of the World. The explanation lies in the air pollution emitted by the coal-burning factories of the industrial era. During the Industrial Revolution, many areas of Manchester, for example, were covered with layers of soot. Black stains on the pavements and buildings of areas such as Victoria Station or Ancoats in North-East Manchester remained until very recently. With the wrong weather, some areas could be submerged under dark, thick smog. This environmental disamenity made them unpleasant places to live and, in response, those who could afford moved to the neighbourhoods spared by the pollution. This sorting resulted in an unequal distribution of social classes across the city. Since the prevailing winds (The Westerlies) in the northern hemisphere blow from the West to the East, the most visible component of such process ended up being the observed West-East differential in neighbourhood composition. In Heblich, Trew and Zylberberg (2016), we document this process focusing on the industrial cities of Victorian England. We reconstruct atmospheric pollution and neighbourhood composition at a precise geographic level across English cities using a combination of historic Ordinance Survey maps and individual census records around the year 1881. To locate the main pollution sources, we identify the location of around 5,000 industrial chimneys on these maps and reconstruct the average annual atmospheric pollution within cities using recent atmospheric dispersion models. The chimneys of Victorian England were not very tall compared to modern standards and the coal was burned at a lower temperature. As a result, the distribution of pollution was markedly influenced by topography and wind conditions. It was also more severe -- in cities like Manchester, neighbourhoods such as Ancoats were far more polluted than contemporary Beijing while some others (e.g., Davyhulme) were below the current pollution alert levels. 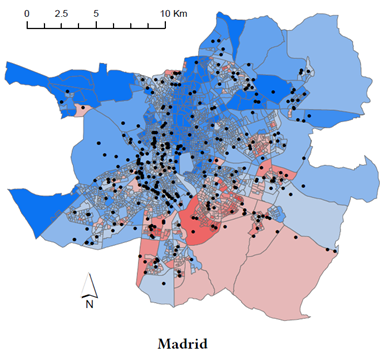 We find that these pollution disparities are reflected in neighbourhood composition. 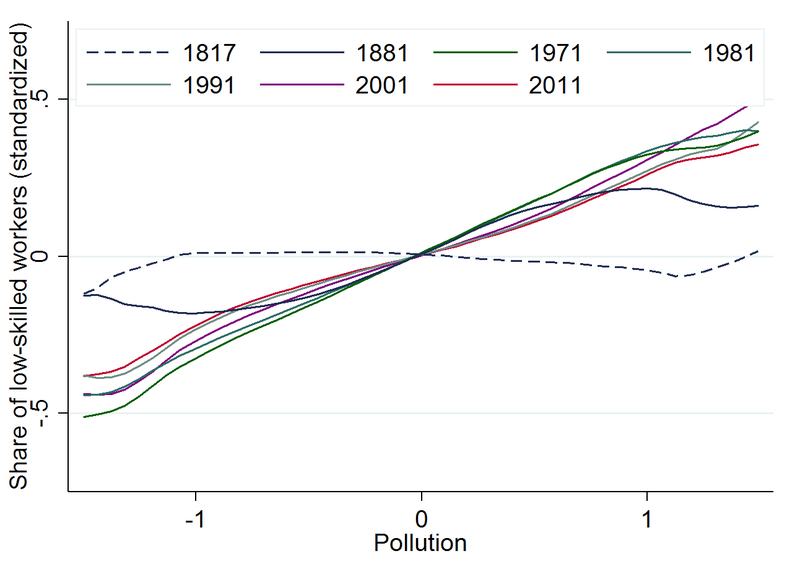 There is a strong connection between the presence of air pollution and the share of low-skilled workers at the end of the nineteenth century. Figure 1 shows that such a correlation was absent before coal became the major energy source at the beginning of the century. The observed effect is substantial: the difference between being in the 10% and 90% most polluted neighbourhoods of Manchester was a difference of about 20 percentage points in the share of low-skilled workers. Most interestingly, the relationship between the presence of historic pollution and the share of low skilled workers in 2011 turns out to be quantitatively comparable to the one observed at the end of the nineteenth century. The previous result leaves one question unanswered. How could sorting caused by 1880 pollution be visible nowadays almost 100 years after the 1926 Smoke Abatement Act and 50 years after the Clean Air Acts (which quickly and considerably reduced the extent of coal-based pollution within cities)? While the average correlation between (past) air pollution and the share of low-skilled workers is almost as large as before in 2011, this observation masks important differences. In neighbourhoods where past pollution levels were close to the city average (either slightly lower or higher), social segregation disappeared between the Clean Air Acts and today. For instance, cities with low overall levels of pollution, where all neighbourhoods were close to the city average, do not display any West-East differences in outcomes today. By contrast, neighbourhoods where past pollution was well above or well below the city average (mostly present in cities with high average pollution) are locked in their historical equilibrium. These non-linearities in the persistence of neighbourhood composition are shown in Figure 1. This illustrates the existence of ‘tipping dynamics’: past a certain threshold, a poor neighbourhood repels richer residents even when the original disamenity has long waned. While it is beyond the scope of our project to identify the main channels at play, we present indicative evidence that this might be related to (the lack of) work opportunities, school composition (Free-Meal pupils), crime incidence or the quality of the housing stock. 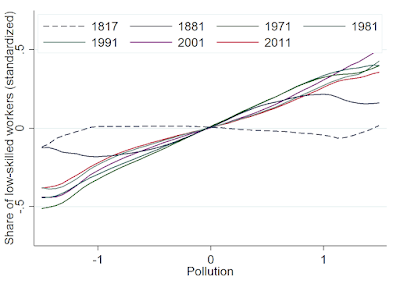 Figure 1: Share of low-skilled workers and pollution (1817, 1881, 1971-2011). So what? Let us go back to the original question. Why are the East Sides of post-industrial cities so poor? Our findings suggest that they are poor because of the high levels of pollution during the industrial golden age, the tendency for the smoke to drift toward the East, the associated neighbourhood sorting and the persistence of segregation in very poor districts. Could these findings inform policies today? First, there are large environmental disamenities in cities of developed economies, and even more pressing challenges in the cities of developing economies. In both cases, disamenities may be unequally spread within cities. The East Side Story shows that any such spatial inequality may anchor neighbourhoods in a persistent equilibrium, and there may be large costs associated with long-term spatial inequalities. Second, many developed economies employ costly urban policies to revive deprived areas, triggering new housing opportunities and business investment. Our findings indicate the importance of a sizable push to bring a neighbourhood past a certain threshold. This is an updated version, originally posted on here on EUROPP. Brexit means that UK regions would no longer be entitled to receive EU Structural Funds. Have EU funds been effective, and what might be the consequences of an interruption of EU financial support to British regions? Recent empirical research (Di Cataldo, 2017) has looked at the economic evolution of two UK regions, Cornwall and South Yorkshire, recipients of EU Regional Policy for ‘less developed regions’ - the highest form of EU aid. In order to single out the effects of the EU funds in the two regions, 1992-2014 regional trends of unemployment in Cornwall and South Yorkshire are compared to those of ‘counterfactual regions’ being similar in all characteristics to Cornwall or South Yorkshire except for not having being eligible to obtain the same proportion of EU Structural Funds. The results provide clear evidence of a significant impact of EU grants in reducing unemployment. Over the fifteen analysed years in which Cornwall has been in receipt of EU funds, the proportion of unemployed people has been consistently and significantly lower than in the counterfactual comparison. 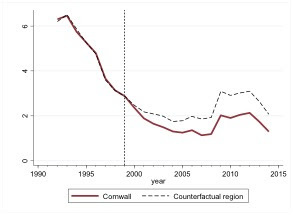 In Cornwall unemployment has declined by 30 percent more than the counterfactual region. The empirical analysis makes sure that this effect is driven by EU funds and not by other potentially confounding policies. Unlike Cornwall, South Yorkshire has been categorised as a ‘less developed region’ only for seven years. Its improved economic conditions relative to the EU average entailed that in 2006 the region lost the status of area in highest need of help and the proportion of available grants reduced substantially. Has this change in eligibility affected the region? The evidence unveils that all the labour market improvements achieved in the period of highest financial support – certified by a lower unemployment relative to the counterfactual during 2000-2006 – are completely offset when eligibility for EU grants as ‘less developed region’ is lost. As shown in the figure below, after 2006 South Yorkshire’s unemployment trend gradually went back to the one it would have had in absence of EU funds. The study also indicates that the per capita GDP in the two regions follows similar trajectories to those observed for unemployment. Both regions converge to higher levels of income while being considered ‘less developed’ by the EU, however this trend is reverted in South Yorkshire when its GDP overcomes the 75 threshold and the region can no longer benefit from the highest form of EU aid. Hence, while EU funds can have a positive impact on the creation of jobs and the promotion of regional economic growth, these outcomes may not be persistent and long-lasting, rather they may quickly disappear after the end of the high-intensity funding period. These findings should foster a careful reflection over the future of poorer UK regions in the event of an imminent exit of the country from the EU. Losing the possibility to access EU Structural Funds is likely to expose the economy of less developed UK regions to potential adverse effects. A region like Cornwall, which has benefitted from EU regional development policies for a long period of time, faces the highest risks. In this sense, the experience of South Yorkshire may represent a valuable lesson; losing eligibility for the highest form of EU financial support can produce a short-term shock, and the labour market and economy can continue to struggle in the medium-term. While European regions losing the status of ‘less developed’ are always entitled to receive a form of transitional funding from the EU, Cornwall would not be eligible for this stream of funding in case of Brexit. Hence, the loss of EU subsidies may be more likely to produce negative consequences on its economy if the UK national Government does not put in place any compensatory policy supporting its transition in funding environment. These potential repercussions apply not only to Cornwall but also to all economically disadvantaged regions dependent on EU aid, such as West Wales and The Valleys, the other UK ‘less developed region’ at the time of the Brexit vote. Airport construction or expansion is often proposed as a policy lever to boost cities, regions and national economies worldwide – although this case is not clear cut as some well publicized ‘white elephants’ and the recent debate over expansion of London’s airports testify. But it is in large developing countries with poor road and rail infrastructure that air transport might offer the greatest potential benefits, providing a way to bridge large distances at relatively low fixed initial costs. In these settings, airports are often built and expanded with the explicit aim of improving connections to peripheral areas, stimulating economic activity in these areas and reducing inter-area disparities (World Bank 2013). However, despite this policy enthusiasm there is relatively little solid evidence that the opening of airports and expansion of airport capacity really stimulates economic development, and none in the context of developing countries. In our recent study (Gibbons and Wu, 2017) , we provide new evidence to answer this question, focusing on the rapid expansion of the airport network in China over the first decade of this century. China provides an ideal setting for this investigation, with around 60 new civil airports opening over the decade accompanied by a massive expansion in air transportation (See Fig 1). Passenger numbers in China increased by around 13% per year after 2006, with 14% per year growth in domestic travel, many times faster than major developed economies. Air freight has also grown rapidly, with an 8-9% per year growth in freight tonne-kilometres. In our analysis, we link information on the opening of airports – mainly small regional airports – to firm level data on manufacturing firms and to county-level administrative data on other economic indicators. Using these data we estimate to what extent improvements in accessibility from these airport openings lead to higher productivity and GDP. Our key finding is that implied travel time reductions and consequent improvements in access to domestic markets boosted industrial productivity and GDP in areas affected by the opening of new airports. The effects are substantial, with a 10% increase in access stimulating industrial output by around 2.5%. Most of this impact comes from the fact that a new airport reduces land-side journey times for places nearby, highlighting the obvious but overlooked fact that the accessibility of airports on the land side is the key factor that should guide airport location decisions. These gains in the industrial sector are presumably attributable to cost reductions in business travel and air freight transport and associated ‘agglomeration’ economies, but we lack data to confirm the exact channels. The productivity impacts are more pronounced in privately owned firms in high population, lower educated counties. We find no effects on employment or wages, but some effects on fixed asset investment, hinting that these productivity changes have largely benefited capital owners. We do not find any clear effects in the service sector, which runs counter to common assumptions and evidence about the role of air transport in business dealings in finance and other services in developed countries (Sheard 2014, Airports Commission 2015). An important feature of our research design is that we focus on the implied travel time reductions and the way these change population accessibility – using an index defined by the population that can be reached per unit of time. This index provides a proxy for access to markets of various types (labour markets, product markets, intermediate inputs, other businesses). 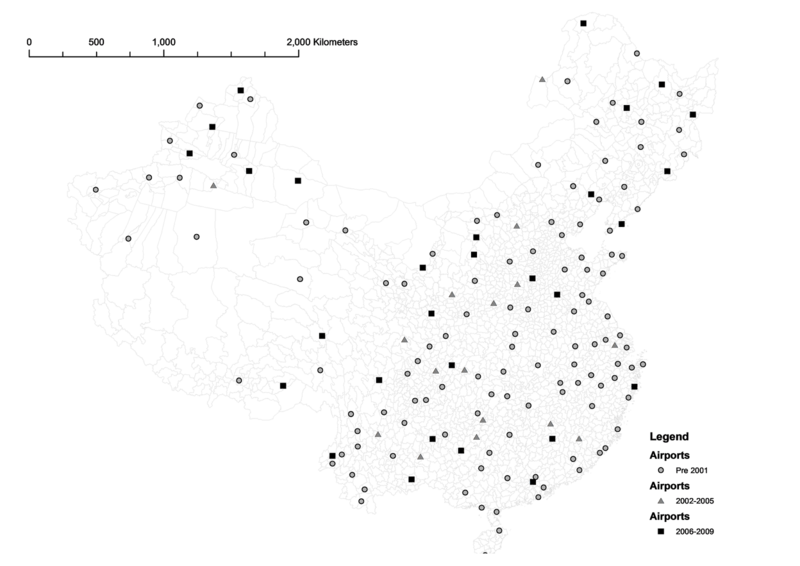 The very large changes in accessibility by air generated by new airports in China are illustrated in Fig 2, for the 2006-2009 period (the scale of the changes is such that 0.10 means a 10% change). When it comes to estimation, we drill down specifically to the impacts on firms in counties which are some way from a new airport, but ‘incidentally’ experience travel time reductions because the new airport is closer than their previous nearest. This aspect of the design brings various advantages. It means that we are comparing places experiencing large access improvements with similar neighbouring places experiencing smaller or zero access changes. It reduces the risks of us finding correlations between airports and economic performance that come about because new airports have been targeted at growing or declining places. It also means we can infer the productivity benefits of the travel time reductions, rather than changes in local economic activity directly generated by airport operations. All previous research on airports has looked at the combined effects of the local economic activity created by operating an airport and any impacts coming about through travel time and trade cost reductions. Doing so can be misleading, because much of the employment associated with airport operations should properly be considered in terms of the opportunity cost, not as an economic benefit – despite the common policy rhetoric of ‘job creation’ from this type of infrastructure investment. Based on this evidence, airport construction policy in China has been successful in boosting local growth in the manufacturing sector. Extrapolating our estimates to the national level, the 35% increase in market access generated by airport network expansion over our study period implies an 8% increase in industrial output. The overall gain in industrial output in this period was 210%, so airports could explain a small but non-trivial proportion of aggregate growth. Some of the increases we observe may represent displacement and sorting of activity between high and low access places, although our estimates are based on within-industry changes, are conditional on employment and capital inputs, and we see no corresponding changes in employment. These facts suggest that our findings are more likely attributable to firm-level productivity improvements. Generalising these findings to other contexts is always risky and it would be very bold to claim similar gains from expanding Heathrow! We have also said nothing about the environmental costs. But air transport infrastructure clearly has an important part to play in large rapidly developing economies, such as China, where distances are vast and manufacturing plays a dominant role. Wenjie Wu is an Associate Professor in the Urban Institute, Heriot-Watt University, Edinburgh, UK, and a research affiliate in LSE’s Spatial Economics Research Center [Centre for Economic Performance(CEP)’s urban and spatial programme]. Sheard, N. (2014) “Airports and Urban Sectoral Employment”, Journal of Urban Economics, 80, 133– 152. World Bank. (2013) World Bank Transport Business Strategy 2008-2012, Washington DC. What should we do to help make our economy work for everyone? The report of the Inclusive Growth Commission, published earlier this week, asks an incredibly important question: What should we do to help make our economy work for everyone? Despite being one of the Commissioners, I should confess up front that I don’t share the reports certainty in terms of specific policy reforms that would work. Some I like a lot, at least at the broader level. I support the general argument that the UK remains overly centralised and that further devolution could include some aspects of social policy. I like some of the detailed recommendations around using a small basket of indicators to measure ‘quality GVA’ – although more for the focus on distributional impacts than the proposed re-labelling. I’d like to see greater consideration given to these indicators in policy development and investment prioritisation. I also quite like the idea of a UK Inclusive Growth Investment Fund incorporating repatriated European Structural and Investment Funds (ESIF) – although I’d want to see that sit alongside a more traditional fund, as well as a non-ring fenced needs-based allocation to local areas. I flat out disagree with some of the other recommendations. I’m very wary about place-based industrial strategies. Particularly if they involve ‘sectoral coalitions’, local jobs for local people or public procurement procedures that emphasise local purchasing over transparency or value for money. I also remain to be convinced on regional banks. This list is far from exhaustive, and people that are familiar with my thinking can probably guess which of the remaining recommendations fit in which camp. But, for me, none of this matters relative to the importance of three central messages that emerge from the report. First, as Stephanie Flanders' introduction puts it: “we need to do a better job of measuring what counts”. As the report argues: “Traditional metrics of economic performance, such as GDP or at a regional level GVA, are a poor guide to social and economic welfare. They also do not tell us anything about how the opportunities and benefits of growth are distributed across different spatial areas and social or income groups.” For me, it is the second part of this argument that is absolutely crucial. I am fed up with seeing arguments for (e.g.) ‘high-tech’ strategies for poorly performing places that don’t (and can’t) spell out how particular investments would ever benefit lower income households in the area. Second, “investment in social infrastructure – including public health, early years support, skills and employment services – should go hand in hand with investment in physical infrastructure”. Back in 2008, the Manchester Independent Economic Review made a similar point. Right then, and right now. Third, we need to “align social and economic policy around promoting inclusive growth”. Again, this is crucially important. For many parts of central and local government, the key policy interventions for delivering inclusive growth lie far outside the traditional remit of local economic growth policy. Forget the details, it’s these three key messages that are central to developing policy that will help make the economy work for all. The White Paper’s diagnosis of the problem is broadly correct – the affordability problem is caused by insufficient building. And the primary cause of this long term lack of building is restrictions on the supply of developable land. However, the White Paper’s claim that “The housing market in this country is broken, and the cause is very simple: for too long, we haven’t built enough homes” does get it the wrong way round: our lack of building is a symptom not a cause of a broken housing supply process. This supply process includes the planning system, local government finance and the monopolised structure of the development industry that these two broken systems have created. We have a tax system that effectively fines local communities if they allow houses to be built as the increase in the number of households puts additional strains on local public services. That does not seem a good starting point. House building is then helped along by a planning system that is cumbersome, uncertain in its decision making and subject to political pressures and expediency. As a result, whether there is a local plan or not, developers can have no idea of the likelihood any application will succeed and even less idea as to the cost of the ‘planning obligations’ that will be imposed if it does. Then – above all – LAs are prevented from delivering enough land both by the religious exclusion of economic ideas in the system they use to determine how much land to supply and by direct restrictions in the form of Green Belts and heights on their ability to supply it. The paper’s repeated emphasis on upholding Green Belt boundaries bars the possibility of development in previously unbuilt areas. Likewise, little reference is made to new incentives for local planners to modify existing building height restrictions. These are the fundamental causes of why we have consistently built too few houses over more than 40 years. And about these fundamental causes the White Paper proposes to do precisely nothing. Our estimates of the accumulated shortfall of house building between 1994 and 2012 were between 1.6 and 2.3 million. Since then we have built some 125 000 a year too few. So since 2012 we can add about 0.5 million to those numbers. And we have consistently built the wrong sort of houses in the wrong sort of places. Among the White Paper’s ‘solutions’ are more local plans – but these plans are very fallible guides to actual decisions about actual proposals. They are often overridden by immediate political pressures and community lobbying, and hence are at best only weakly enforced. We need a ‘rule-based’ system, such as a Master Planning or Zoning system. Indeed, we already have one element in the house building process that successfully works in that way: Building Regulations. Then, the White Paper claims bringing forward more brownfield sites and better use of public land will solve the land supply problem. Well, we have been saying the same things about brownfield and public land since the late 1990s and have excellent data on both (see example here). As we have consistently argued this cannot solve the problem; nor will it. Too much of the brownfield land is in the wrong places or too expensive to build on sensibly. And anyway there is far too little to catalyse the real competition between sellers needed in land markets. A standardised system of forecasting local housing ‘need’ might conceivably help to address the coordination problem implicit in local authorities free riding on each other. But the real problem with our system for deciding how much land to supply is that prices are determined by the interaction of supply not with need, but with demand and demand is largely driven by income. The number of households – even if accurately forecast – which is not possible given that the numbers of households in a LA are themselves determined by the relative price of houses – does not much affect demand, so it has surprisingly little influence on price. Indeed a LA can always price households out of its area and so have no unmet ‘need’ at the observed price of housing. Moreover, close reading of the White Paper reveals the proposal to standardise the method LAs use to forecast housing need is not in fact a proposal. It is a proposal to consult about a proposal. Any actual change would require a consultation period, a review period and then bringing forward changes in legislation. And then finally rolling out these changes and implementing them successfully at the local level. There is little hope any actual changes could be in place in even the medium term, even if having a standardised method to forecast need would help: which it would not! This White Paper emphatically represents yet another missed opportunity. Not a single proposal will have any measurable impact on the supply of houses by 2020 and most will never have an impact. There are a few useful suggestions. The Housing Infrastructure Fund is welcome and could make a difference. But that was announced some time ago and the more sceptical of us would want to examine the books very closely to satisfy ourselves it really was new money. A provision for New Town Corporations might help. But again this is for thought not action. Taking steps to improve the transparency of ownership of land and of options to develop it is a good idea: but again it is not action, only possible action. And, of course, the need for it is only because the shortage of building land is so acute that land prices are now so high they financially justify the complicated legal and financial shenanigans such options on options on land represent. One thing is totally clear, however; they represent a deadweight loss to us all. The fundamental problems with housing remain the same as in the last fifteen years and of those the most fundamental is the lack of land for development. Only fundamental reforms of our housing supply process will help and this proposes none. Indeed it in some ways goes backwards. It goes from a set of (not very good) mechanisms delivered in 2007 with the Regional Spatial Strategies to a set of aspirational gestures. Frankly the Secretary of State could build more houses with a magic wand. Can a new generation of political leaders tackle Britain’s regional inequalities? 2017 will see the UK begin its departure from the European Union. However, as the UK seeks to shed some politicians in Brussels, we will be getting some new ones at home. Greater Manchester, Liverpool, Tees, West Midlands, Bristol and Bath, and Cambridgeshire and Peterborough will all go to the polls to elect mayors and will gain new powers over transport, housing, business support and skills. Unfortunately last week it was reported that the Sheffield City Region would miss out. That’s a concern as new research by the Resolution Foundation shows that the area has some pretty fundamental living standards challenges that need to be addressed. Our analysis find that the city region is the low pay capital of Britain – with typical workers earn £43 less a week than the UK average. The region desperately needs to get devolution back on track. Sheffield may be the low pay capital, but the problem of low pay affects the vast majority of cities in the Midlands and the North of Britain. It is well known that country’s economy is skewed towards London and the South East but the chart below emphasises this. 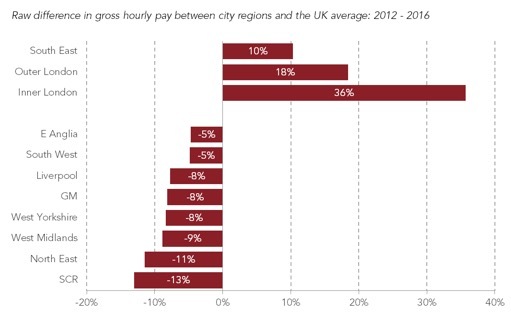 Gross hourly pay was 36 per cent higher in inner London compared to the UK average between 2012 and 2016, whereas it was 13 per cent below the average in the Sheffield City Region. Note: Difference in gross hourly pay is calculated as an average of the years 2012-2016 using data from the Labour Force Survey. 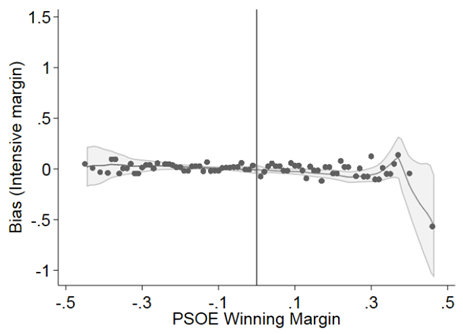 Multiple years were rolled together to provide enough observations to estimate the differential in a regression model. East Anglia and South West contain the devolved areas of Bristol and Bath and Cambridge and Peterborough. What accounts for the pay penalty experienced by Sheffield and other areas outside of the South East? Partly it reflects the fact that these areas tend to have a greater proportion of employees who are paid less (part-time workers, those on Zero Hours Contracts, etc) and a greater share of firms that pay less (those in the retail and hospitality sectors for instance). However it is also true that like-for-like workers earn less in these areas than in the rest of the country. In essence there is both a compositional and a productivity problem. 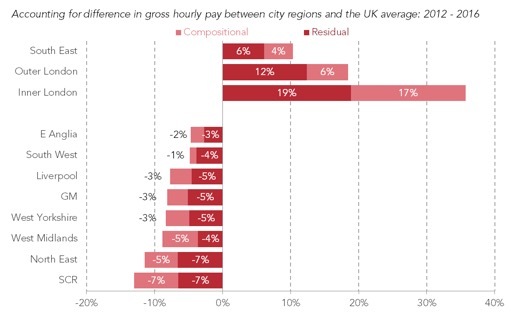 To estimate how important each of these factors are we ran a series of regression models in which we estimate the difference in gross hourly pay between workers in these areas and those in the rest of the UK controlling for a range of job, workplace and personal characteristics. We find that in all the areas above pay gaps remain even when we compare like-for-like workers. This ‘residual’ reflects differences in productivity and other factors that we cannot directly measure. The relative importance of the two factors is given for each region in the chart below. Note: Analysis carried out using the Labour Force Survey, full details of models can be found in Annex 3 of our paper, available here. In all areas compositional and residual factors play a part, however there are differences in the relative importance of the two. Outer London does have more high paying firms and higher paid employees, but higher productivity seems to play a bigger role in this area. In Sheffield, compositional differences and lower productivity each play an equal part. The retail, manufacturing and office admin sectors are all large employers in the region and correspondingly all significantly contribute to the region’s productivity deficit. Education is the only sector that meaningfully raises the productivity of the region compared to the rest of England. The scale of the challenge facing the South Yorkshire region is clear. This challenge is just as much a task for national politicians as it is one for local leaders. Nevertheless devolution would have bolstered the chances of local leaders starting to get to grips with it. Despite the limited powers on offer, devolution does provide greater control over how the scarce resources available for economic support are spent. An effective mayor also provides a figurehead who can convene large employers and key businesses. Changes to transport and housing can make an area more attractive to firms and high skilled workers. It remains to be seen if the six regions that are going to the polls this May will use these new powers effectively. What is certain is that South Yorkshire will not – yet – get the chance to.